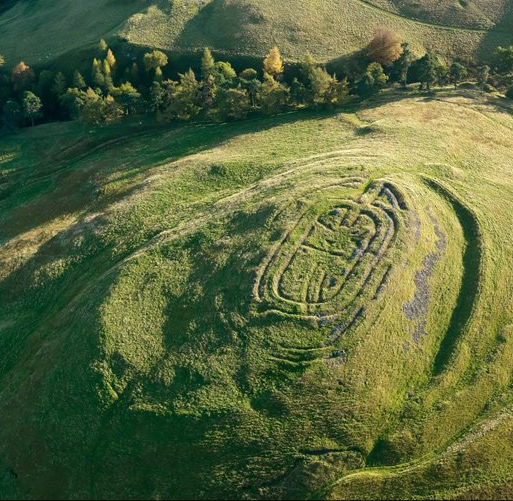 Trenches on Castle Law in Perthshire were picked out by Edwin Bell at the end of the 19th Century and show the remains of earlier stone ramparts. It's a bit like a mini with wings, says Dave Cowley, aerial archaeologist with RCAHMS (the Royal Commission on the Ancient and Historical Monuments of Scotland). And as we walk down the small runway at Fife Airport towards the even smaller Cessna plane, it seems it is an entirely apt description. Dave and his colleagues make 40 to 50 trips a year in this four-seater plane and today they are squeezing two more guests in - myself and cameraman Douglas Macleod - to get a glimpse of their work. Most archaeologists keep their feet firmly on the ground but Dave is convinced you can see so much more from the skies. As we shudder up to a couple of thousand feet above Glenrothes, he points out crop markings in the fields below, remnants of ancient forts and other markings unnoticed from ground level. Modern field lines contrast with an older walling system at Balnagleck Farm near Machrihanish on Kintrye. Surveyors and developers are grateful for views of the urban development. Historians and academics can contrast current photos with much earlier ones to see what has changed. All are added to the massive photographic collection RCAHMS maintains - upwards of 1.6 million photographs. The Taobh Tuath peninsula on the Isle of Harris is the site of a 9,000-year-old hunter-gatherer camp, which was discovered in 2011. It's not for the faint-hearted. Dave has been doing this for 10 years so he is blasé about throwing open the window and leaning forward for a better view. As Ronnie the pilot banks the plane for a better view of the Forth Bridges, Douglas and I let out a comedy shriek. Hopetoun House is an amazing sight from the air - its formal gardens offering perfect symmetry from the air. Neighbouring Mavisbank is a more poignant sight, lying derelict, its gardens reclaimed by the natural landscape. From the air it seems so much larger, so much less vulnerable to decay. Over the Pentland Hills, Dave points out even older markings - ancient fortifications made by man, other landscapes altered by time and weather. Different times of year offer different weather conditions, and a chance to examine certain kinds of formations. Summer is good for buried archaeology. It also offer the sorts of clear, clement conditions required for photographing water. Autumn with good light is the best time for built heritage. Ruins of the medieval chapel of Teampull Eion on the Isle of Lewis. As we circle back to Fife, avoiding a scary thunderous rain shower on the edge of Leith, there's a chance to look at one of Scotland's newest landscapes from the air. Charles Jencks's latest land sculpture is being built on a former open cast mine in Fife. The swirling green mound rises up from a sea of mud and rubble - an extraordinary sight not yet properly visible from the ground. Stone circles and tombs such as the Ring of Brodgar were built to be highly visible in a society for whom death and religion were important. With that, it's back down to earth with only the slightest of bumps. Ronnie parks the aircraft and Dave packs up his photographic equipment and returns to the office to download his latest images. Many of his photos feature in a new exhibition at the Lighthouse in Glasgow - a collaboration between RCAHMS and Architecture and Design Scotland. Photos are enlarged and on tables beneath giant magnifying glasses, allowing the visitor to have that same birds' eye view of Scotland, with their feet firmly on the ground. The Above Scotland exhibition will run until the 23 January 2013 in Gallery 2, The Lighthouse, Glasgow. Admission is free.